Posted July 15, 2015 by Jackie McMillan & filed under Booze, Chinese, Eat & Drink. Pungent green fire is igniting my nasal passages, but I’m smiling! The genius addition of glossy wasabi mayonnaise to Lan Yuan Angus Beef ($26) makes it an easy favourite in Top Ryde’s new ‘bamboo garden’. Seek haven in Taoism or Buddhism – Tsing Tao ($8) or Lucky Buddha ($8) – to ease the pain. Designers Vie Studio have drawn their inspiration from traditional Chinese gardens (lan yuan). Who knew plastics could look so luscious and substantial? Clever use of light over tables ensures you won’t squint at menus, while the darkened restaurant surrounds create intimacy, and remind me of a movie set. Alfresco tables offer the opportunity to peer through a Chinese bamboo fringe at a giant outdoor TV screen; and, with a little imagination, you’re in Hong Kong. The chefs also hail from the former British colony, meaning they’re adept at making the sort of Southern Chinese cuisine that suits people who don’t tolerate heat, starting with a very gentle XO sauce coating Live Pippies ($30/500g). 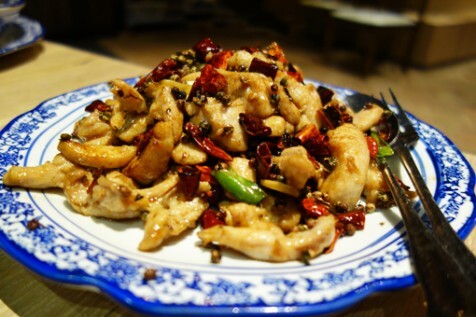 Fortuitously for me, they’re making two versions of the Szechuan Chicken ($22), because I like my dishes hot. Lan Yuan Fried Rice ($18/small) proves worth the spend, with tender scallops, king prawns and glistening orange crab roe; while addictive Egg Yolk Tofu ($20) should test the willpower of those who mock bean curd.